Laurence S. Youngblood was founding co-partner of the nation's largest oil and gas leasing firm, Youngblood and Youngblood, from 1938 until his death in 1965, leasing more than ten million acres in every then producing oil and gas state and Canadian province. Laurence was also a President of the Oklahoma Independent Petroleum Assn., and he was a Director of the Independent Petroleum Association of America. Laurence was in the oil industry 42 years, forming a wholesale oil distributing business at age 17 in 1923, and entering the general oil and gas production and leasing industry in 1928. Former Youngblood Hotel, Enid The 15-story 300-room hotel built by Laurence Youngblood in 1929-30, is now Continental Tower North. The timeless building is a landmark. 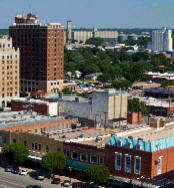 In 1930, Laurence built the 15-story, 300-room Youngblood Hotel in Enid, OK, which he operated until 1934. The former hotel is now one of two classic office towers of publicly-traded independent oil and gas company, Continental Resources, Inc. (NYSE:CLR). Youngblood developed Canada's "Standard Oil and Gas Lease" in 1947, which is still in use today. According to the Youngblood Energy Library website at O. U., Youngblood was also "instrumental in the development of professional standards and educational programs for the profession of petroleum land management" at Oklahoma University, which were widely used nationwide. 70 Years in the Oil Industry From 1937 to 1940, Loyce Youngblood was a secretary to legendary Oklahoma oilman and Governor Frank Buttram, then worked 25 years beside her husband Laurence in the oil leasing and production business across America and Canada, helping him build the company into the nation's largest oil and gas leasing firm until his death in 1965. Loyce formed the L. S. Youngblood Co. in Oklahoma City from her portion of the partnership assets, remaining active in the oil industry another 42 years in several producing states and Canada until her death at age 92 in 2007. Establishes "Magnificent" Library Loyce established and funded the new Laurence S. Youngblood Energy Library on the University of Oklahoma campus in 1989. With its 170,000 map sheets and its 100,000 cataloged volumes, the Youngblood Energy Library is widely acknowledged as one of the "top five geological Libraries in the nation.” 1 The Youngblood Library website states, "Mrs. Youngblood has donated this beautiful space in her husband's memory and has attended to the details of its design, decor, and construction"2. Loyce exquisitely furbished the library, featuring the extraordinary "museum-quality" fossils and mineral specimens which she collected worldwide and donated to the library. Youngblood Energy Library Sarkeys Energy Center tower - O. U. The 2nd floor library surrounding the atrium is the heart of the Sarkeys Energy Center at O.U. Loyce Youngblood began many anonymous philanthropies in the 1970s when she and seven others, including Pat Boone, quietly donated a hospital wing for the famous Scripps Clinic in La Jolla, CA. Loyce was named a to the Board of Directors of the Oklahoma Medical Research Foundation in 1984 and a Life Director of the foundation in 1987. Loyce received an honorary Doctorate of Humanities degree from Oklahoma Christian University in 1988 for her gifts and fund-raising "activities on behalf of the college building program". She was also a founder of the Seminole Nation Historical Society. Loyce left substantial undisclosed gifts each to two non-profit organizations and two Oklahoma area universities, as well as to family members and two outstanding "50-year" key employees. Copy and paste: www.libraries.ou.edu/locations/?id=19 (Do not just click on link since it then leads back to a slow-loading and complex main library systems home page).